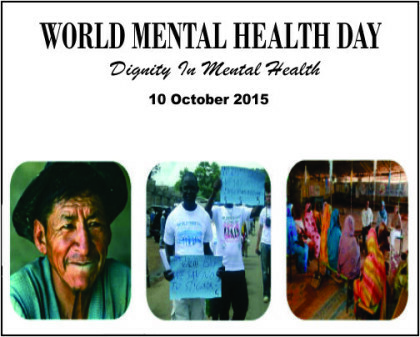 World Mental Health Day, 2015 theme- Mental Health With Dignity. In our country like ours, where mental illness is always treated with slight disdain and often leads to abandonment of the patient, its important for us to realise that mental health issues are on the rise, can affect anyone and is slowly becoming a part of life. With Today being World Mental Health Day, 2015 There are few points that I would like to lay down with regards to the current mental health status of the country. 2) NIMHANS facts- There are total 7CRORE MENTALLY ILL IN INDIA. Of them, 35 lakh require admission but only 40 institutions dedicated to mental health with about 25000 beds only. Point no 2; Where are the providers? No medical cover provided by insurance companies for those suffering from mental disorders. 1.80% of medical care available for mental health is in private sector, which is expensive. 1) Most of mental health institutions are overcrowded with almost three times the number of patients more than the capacity. 2) Women are made to sleep on floor they catch their hair shaved off. 3) Many cases family not ready to own their own relatives. 4) Many examples of family delaying treatment because of the social stigma attached to it. Which brings me to my Point 6- What’s the way forward? The theme of ” Dignity for mental health” on this World Mental health day, is taken as per the decision taken in U.N convention on the rights of persons with disabilities. It highlights the importance of protecting the human rights of disabled people.